'The Glorious Twelfth' was the start of grouse season. But did you know that hare season also starts in early August? 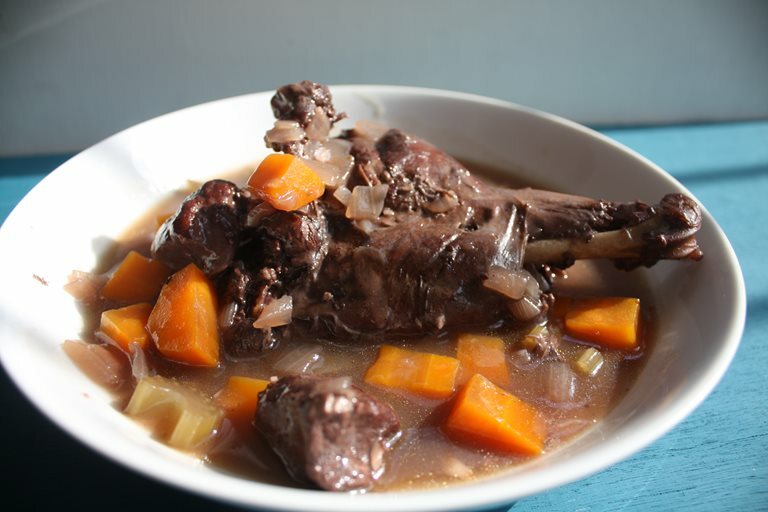 Rachel went on a hare shoot in Scotland and made some very economical jugged hare with her bounty. "First catch your hare" - so started Hannah Glasse’s jugged hare recipe, in her seminal eighteenth-century cookbook: The Art of Cookery Made Plain and Easy. Sadly, the infamous cooking instructions were misquoted (Glasse actually wrote 'first case your hare'). But ‘first catch your hare’ is far more entertaining, so the saying stuck, and has since entered the arsenal of common British phrases - a gamier equivalent to counting your chickens before they’ve hatched. Well, believe it or not, I did catch a hare. On ‘The Glorious Twelfth’ this year, I was invited on a walked-up shoot in Aberdeenshire. The hill was teeming with white hare. Although they don’t classify as vermin - as rabbits do - hares can become a problem on a grouse moor, and need culling. One of the biggest threats to grouse is tick. A baby grouse is just a tiny thing, and a few of the blood-sucking insects can be fatal. Hares count as ‘transmitters’ of tick - there’s a distinct correlation between culling hares, decreasing ticks and consequently increasing the grouse population. So the hare season starts on 1 August, and continues through to the end of February. A grouse is a desirable bird, and can be sold for huge amounts - particularly in August, the start of the season, when they’re young and tender. But there’s less interest in hares. After shoots, they’re sold to game dealers for little more than £1. Game dealers aren’t so interested in hare, as they have to invest far more time in their preparation than a game bird, which are often sold on in braces, unplucked and ungutted. Not only is a hare time-consuming to skin and gut, but there’s not much of a market for it. Lots of people have negative associations with hare - perhaps it’s the strong, gamey taste, or bad experiences from where a hare has been cooked to quickly, and the meat has been tough. This lack of demand means that hares rarely make it down south. A great pity. So I jumped at the opportunity of getting my hands on a hare in Scotland, and stowed it away in my hand luggage on an EasyJet flight back down to London. So seeing as I’d “first caught my hare”, I thought that I had better jug it. The term ‘jugging’ comes from the traditional practice of cooking an animal inside a jug which is placed in a pan of hot water - like a sort of meaty bain marie. 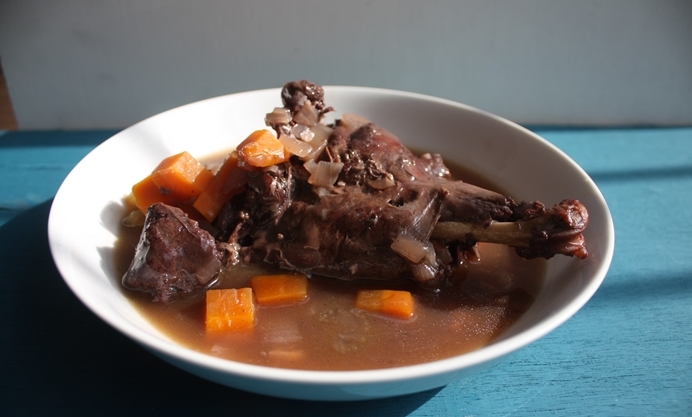 But the results are tantamount to stewing the hare in a casserole dish at a low heat for a long amount of time. Many jugged hare recipes also allude to forcemeat balls which, in many ways are a Medieval way of shoehorning as much meat as possible into the dish. I didn’t want too many flavours to distract from the hare’s distinctive gamey flavours, so I decided against forcemeat balls and kept the recipe pared down, and simple - making the hare the star of this beautiful dish. Rachel is a cook, food writer (food editor of Reader's Digest) and all-round epicurean.